After Justin Bieber and Orlando Bloom nearly came to blows at Ibiza hotspot Cipriani on July 30, the singer took to his Instagram to taunt the actor with a very telling photo. 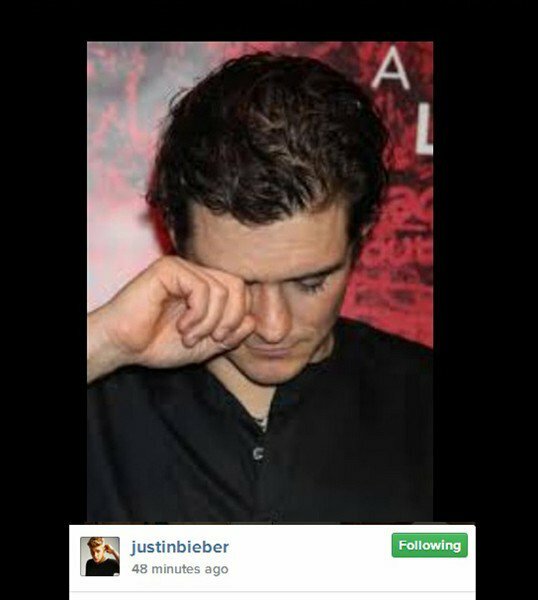 The photo was of Orlando Bloom, 37, appearing to cry at the opening night of Romeo & Juliet in September 2013. Justin Bieber, 20, left it without a caption, but his message was pretty clear. Earlier in the day, following the alleged altercation, Justin Bieber posted an image of Orlando Bloom’s ex, Miranda Kerr, in a bikini, only to delete it a short time later. According to Us Weekly, the incident in Ibiza started when Justin Bieber made a comment about Miranda Kerr to Orlando Bloom.